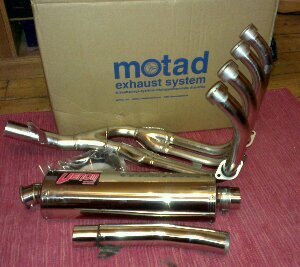 Recently I splashed out on a new Motad Venom complete exhaust system for my Fazer. Comprising of a stainless steel downpipes, nice oval end can and all the trinkets for fitting. Motad have their factory located in the heart of the black country up in Walsall, which is nice to know as supporting local trade is always preferable. Motad sell their products direct through their ebay shop or their website, and in either case you can get a better price than going through a reseller. I ordered their full exhaust system; downpipes, gaskets, link pipe, end can and necessary clamps/brackets. Motad offered me a good price in exchange for a write up on this blog. The whole lot arrived quickly in a lot smaller box than I was expecting, but dismantled the system is not as large as you first perceive. On opening, I had a box full of shiny goodies. All packed well, everything needed for installation included and a short set of instructions for fitting. This is the first time I’ve tackled the fitting of downpipes, but after consulting my Haynes manual, some guides on the Fazer Owners Club forums and various other websites, it didn’t seem to difficult. Here are the steps I followed.